A few years ago, I set a goal to attend a creative retreat or workshop every year. I know that as a maker and artist, getting away to connect, grow and recharge is invaluable. 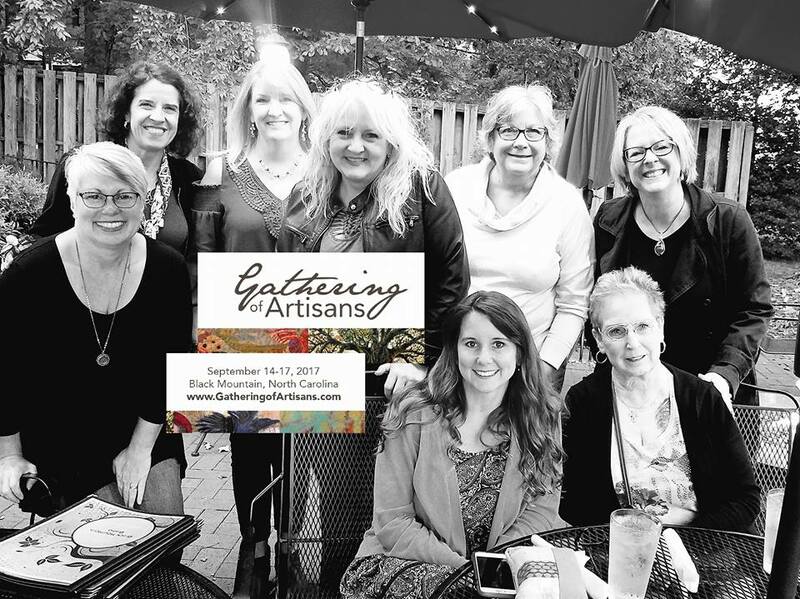 We know God is raising up an army of artists and our vision for Gathering is a powerful time of worship, mentoring & creative expression centered in the Presence of God and the community of artisans - both master & emerging. We have intentionally planned this weekend in an environment conducive to building relationships and growing together in unity. My sister Michelle went with me, and we had a wonderful time. From the workshops to the worship services, the southern comfort food and new friends... it was a truly incredible experience. This is my sister Michelle and I. We flew into Greenville, South Carolina and then drove an hour and a half to Black Mountain, North Carolina. We lived in South Carolina when we were younger (Navy kids), and enjoyed exploring in downtown Greenville. Michelle and I with some of our new friends. This was after the conference was over, enjoying an art gallery in Asheville. Other highlights included hearing from Aeron Brown, Jim Banks, Jacob Daniels and Matt Tommey (who master-minded the whole event, plus has a fantastic mentoring group and a passion to help artists grow in the Kingdom). I'm happy to be home with my loves, with renewed vision to keep creating... and I can't wait to go back for the next Gathering. I strongly encourage you to make a goal for yourself to attend some sort of retreat or workshop regularly. Whether local or across the country (or beyond! ), it's good for the soul and refreshes you in ways you don't realize you need. No guilty feelings of leaving home allowed! Investing times like this in yourself benefits your loved ones, because you get filled up and come home recharged. Your family may miss you while you're away, but they'll appreciate the refreshed you when you return! Do you have a favorite creative retreat or conference that you've attended? I'd love to hear about it!